What a Summer this has turned out to be, after a four week warm spell of absolutely stunning weather the models once again produced yet another great run for hot weather lovers. A very strong area of high pressure would dominate the forecast period for the last week of June and temperatures could surpass what we experienced during the last event, in fact, GFS was predicting temps of 27 degrees C, this model actually underdoes maximum temp amounts so there was a risk of temps exceeding this value and perhaps even threaten our June records. Every day was hot, sunny, blue skies and simply remarkable, this was the dream forecast we had all been waiting for in this country and it was actually happening, we couldn't believe our luck. June 27th was expected to be the hottest day of the year when temps could peak at 30 degrees C somewhere in the country, the night before was warm and sultry and it was difficult to sleep, I had been out shooting and time lapsing Noctilucent Clouds every night back to back until 03.00 in the morning however due to the heat it would take another two hours before I even had a chance of falling asleep, however with another hot day in store and nothing pressing to get up early for I decided to make this a longer night than usual, then by pre-dawn I was in blissful sleep, in truth I was exhausted from the recent NLC nights and simply fancied a lazy morning. 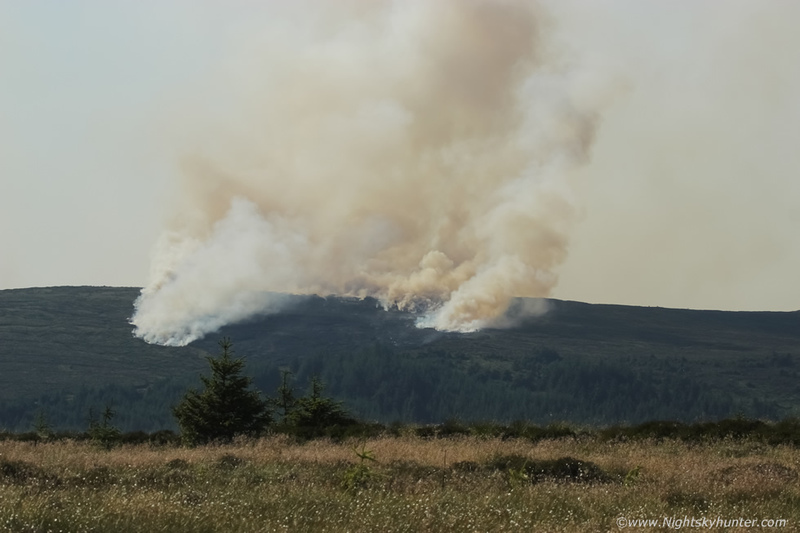 On the morning of June 27th my mobile began ringing at 08.00 BST, it was Conor McDonald, there were sightings of a large gorse fire on Glenshane Pass which had been reported at 05.00 to the fire service, reports were appearing on social media and Conor could see smoke over the mountain from his back yard and he suggested I should get on the case. For a split second I actually thought Conor was joking, for just the previous night the NI fire service had posted a warning about gorse fires on social media, and the following morning there was now a gorse fire burning in the area, the timing was uncanny, however Conor was deadly serious, I didn't need to be convinced, I quickly changed, threw water on my face, packed the gear into the van - DSLR and drone fully charged and ready for a quick reaction event such as this one - water canister filled, and I was on the road and making my way up Glenshane Pass by 08.30. As I ascended the mountain I observed what I at first thought was cloud over the summit, however when my awakening brain looked again I realized it was not cloud but smoke, and it covered much of the W skyline, suddenly my adrenaline was up, this was the real deal. From my vantage point at the bottom of the Pass it looked like the smoke was over the main road itself and I began to wonder what I might see on top, however when I reached the Pass it was clear that the fire was much further away, in fact, it was burning over the very top of the mountain far from any roads, it was literally in the middle of nowhere and on the highest place possible, I knew then that this was going to be a tough one to battle. I took the back road over the cattle grid and drove onto a narrow mountain road and pulled over for a look. The fire's position rite on the summit made for a striking sight, it simply couldn't be missed, the source consisted of many fires burning in a row. I immediately got the drone in the air, it felt surreal, it seemed that only minutes ago I was sleeping and now I was preparing for a drone flight, it seemed like there had been no transition between the two, literally from sleepsville to drone flying, luckily I'm a very active drone pilot with hundreds of flights logged so this was like second nature to me, quick visual check for no threats, quick assessment of the area, safety first, then once satisfied I took off, checked battery and aircraft health then flew out across the countryside and ascended for a look. The fire was further away than it looked so I recorded video and captured still images (above) then began to make my way back. 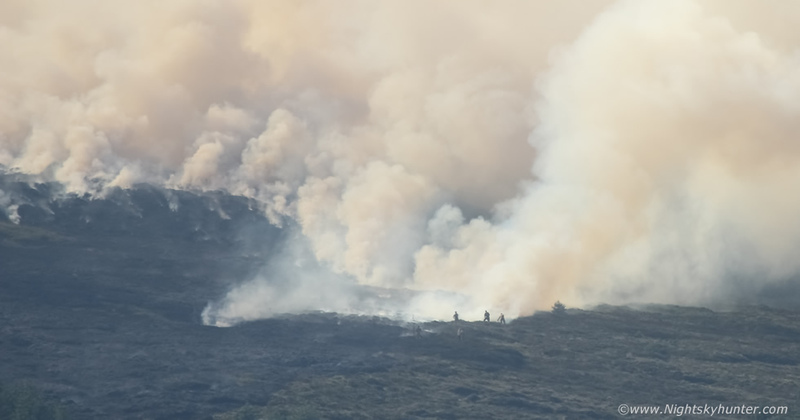 A local pulled up in a jeep to watch the drone then came over for a chat, turned out his brother was in the fire service and he confirmed it had been called in at 05.00, fire fighters had been on location all morning to monitor the event and request support units for what looked to be a long day of fighting ahead. 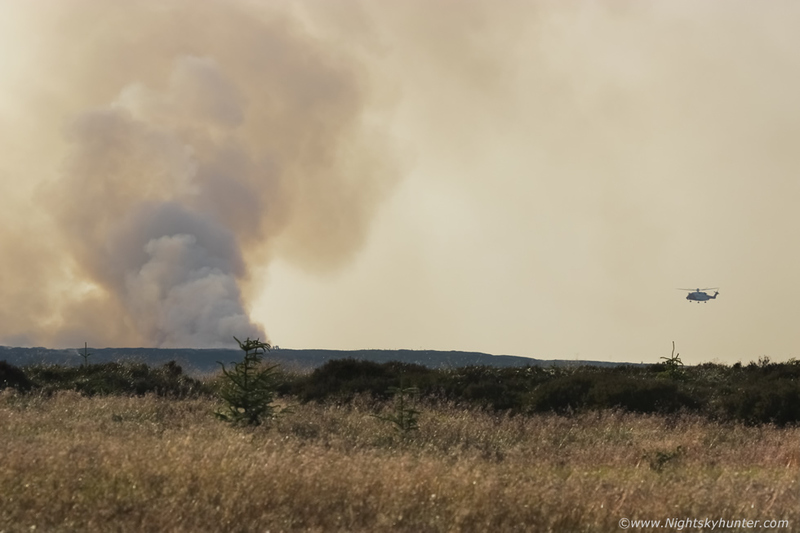 We observed for a while and through binoculars we could see the fire moving with time and it looked to be getting worse, the guy suggested another area further W where I could get closer with the drone so I bid him farewell and hit the road in search of a better position. I was very familiar with the area he suggested, the Birren road which connects Glenshane to Draperstown, I had been on it many a time snow chasing so it was certainly a good location further W, I ascended the steep mountain road and pulled over in what I considered to be a perfect location. 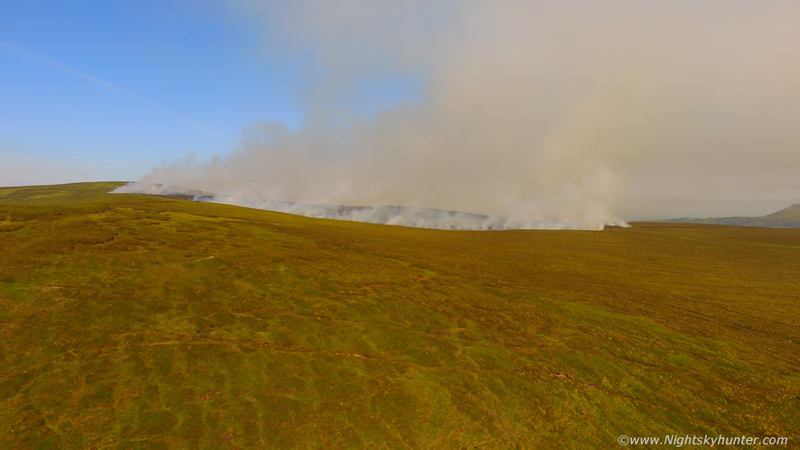 I was much closer to the fire, the breeze was a cross wind and I had great line of sight and already on high ground. Drone flight two commenced and I was in the air filming the scene. 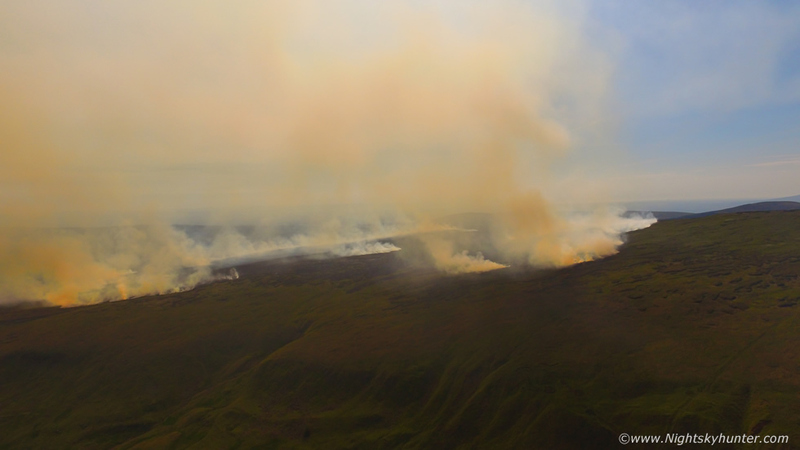 The drone provided a terrific view of the fire revealing at least seven sources all burning at once. Climbing to 120m in altitude, quite a sight with the yellow smoke contrasting against the blue sky and green mountain, it still seemed surreal that this was happening. The time was 10.00 and the temperature was already very warm, I was sweating like mad, however I never stopped concentrating for a second until I got the footage I wanted and had the drone back in the van safely. During this time another fire fighter had arrived on the scene and we had a great chat about the likely cause, strategies for fire fighting, and the science behind fire ignition, it was a fascinating conversation. I was told that fire crews were watching and monitoring the situation closely, if it didn't threaten life or property then the plan was to wait to evening when it cooled somewhat, with the fire's remote location and with the hottest day of the year expected it would be a very tough job for the crew so at the moment it was a matter of waiting to see what it would do. 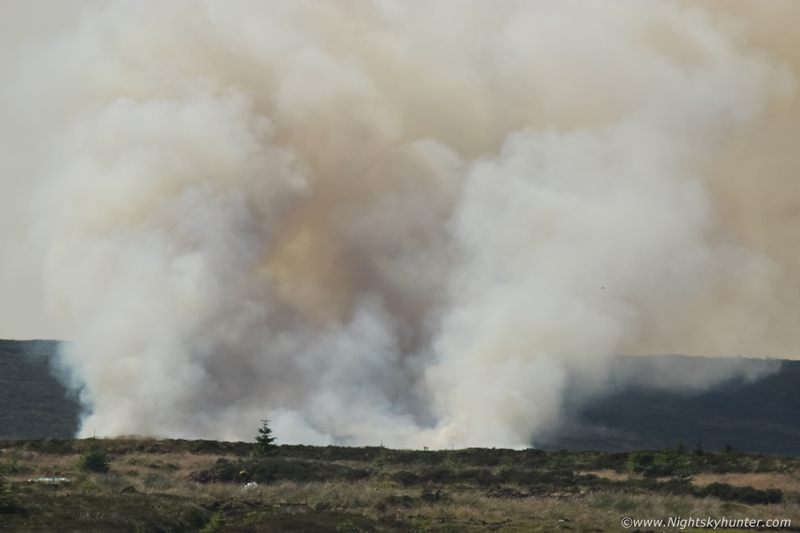 I drove back to Maghera, then had to do a run to Derry/Londonderry, then back by mid afternoon, by then I was fully expecting to see the fire dwindling or perhaps even extinguished entirely, however much to my surprise it was the complete opposite, the morning show was only the opening act, the real gorse fire was just beginning. 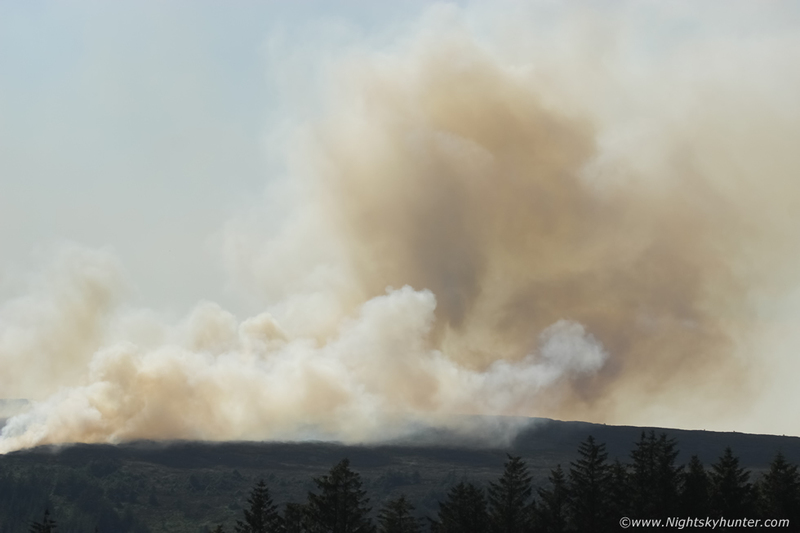 Even from miles outside Dungiven smoke covered much of the sky and mountains, once I passed through the smoke to the other side I could see a major fire raging, it was now down the mountain below the summit, closer, bigger, wider and meaner. I went back to Maghera and refilled my water supply then made my way back up the road. 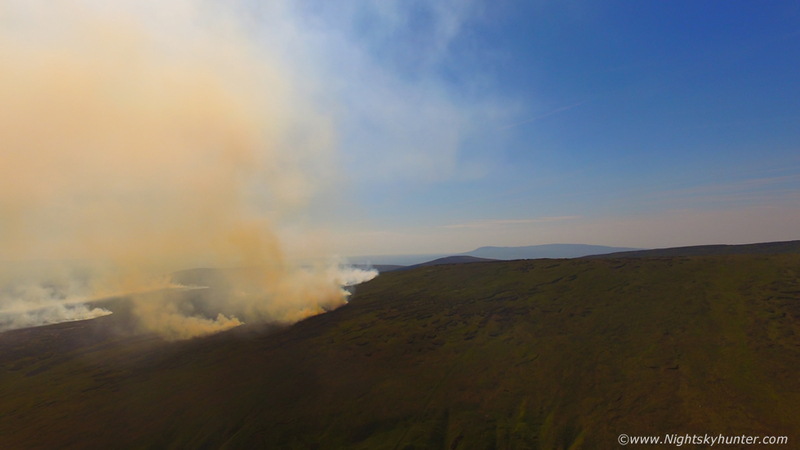 I got a call from photographer Nigel McFarland from AerialVisionNI who was also heading to the scene, we arranged to meet and document the event, I had a feeling this was going to turn into one of those memorable epic shoots. I drove back to the top of the pass and pull into a lay by for a look. Huge fire raging on the flank of the mountain with another to it's left running for over 1km across the hills with smaller fires between. I was out shooting with the DSLR and 100-400mm, shooting stills and recording video, the heat was intense outside, I opened the side door and sat inside the van so I could get shelter from the sun and some support to hold the camera relatively steady as I panned across the mountain. The heat inside the black van was stifling, so hot, I felt suffocated as if I couldn't get enough oxygen, however concentrating on focus and exposure kept my mind on the task in hand. 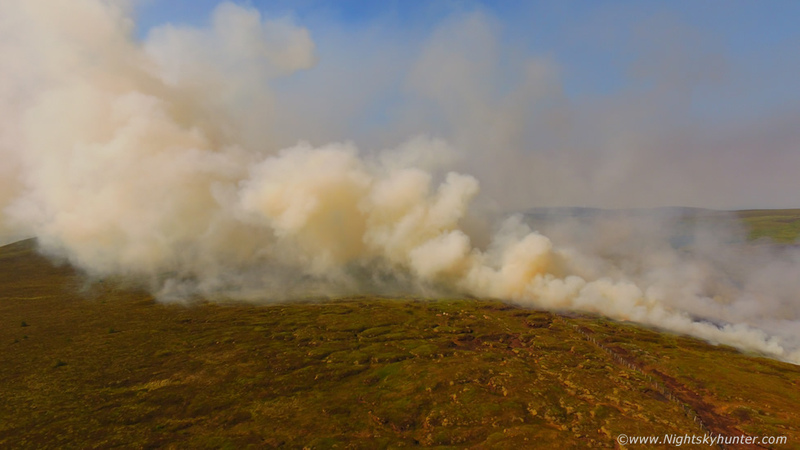 The fire was huge, I have documented a number of gorse fires on Glenshane Pass over the years however this one was without question the biggest I have ever seen. Social media was full of reports and the event would soon be featuring on the afternoon news. Several km of fire burning away, this line extended far outside the frame to the L and R. Nigel arrived and we soon came up with a plan, we wanted to capture these dramatic new developments with the drones however we needed a good launch site away from people and roads, so we hit the back road, then ventured up a rough mountain trail which was better suited for tractors or a good 4x4, I'm certain this was the worst road I have ever drove on, a small hard dirt trail which ascended steeply surrounded by gorse and peat land either side, the road was punctuated by massive pot holes, ridges and rocks, the vans bounced up and down hard, my bull bar hit rocks hard and stones smacked the underside of the body, camera bags rolled over, gear fell, it was mental, however we came to the top and stopped, the driving had been worth it, the view towards the fire offered perfect line of sight and we where literally far from any person. Two drones in air simultaneously, both pilots providing a verbal description of altitude and position constantly, we fly a lot together so this was like second nature once again. 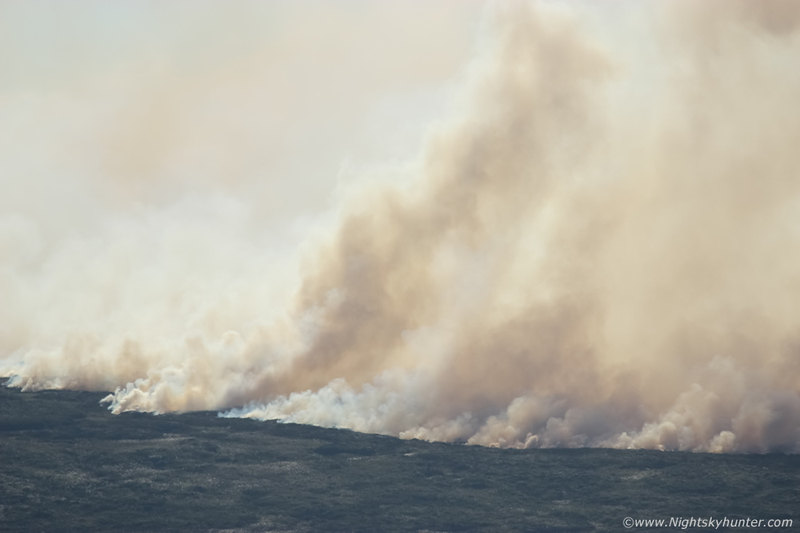 Once the drones reached the new fire we were awestruck, what looked like one fire from the ground was actually several fires clustered together, they formed a V shape as they converged on the mountain. I was recording video then stopping to hover and take stills, then back to video once more. The real time view on the screen was spectacular, this was the reason I got a drone two years ago, for events like this, the scene were simply mind blowing. 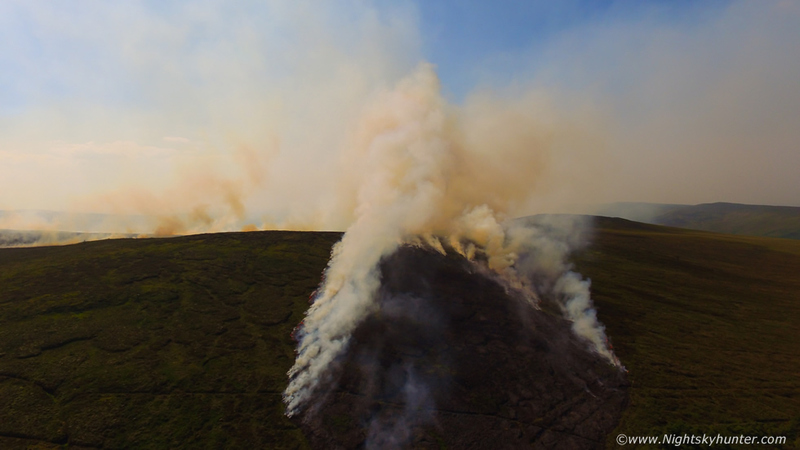 Fire and smoke blew over the summit and along the other side, this was one of two massive areas on fire, rite now we had broke a new NI record when 30.8 degrees C was recorded, this was the hottest June day since records began. 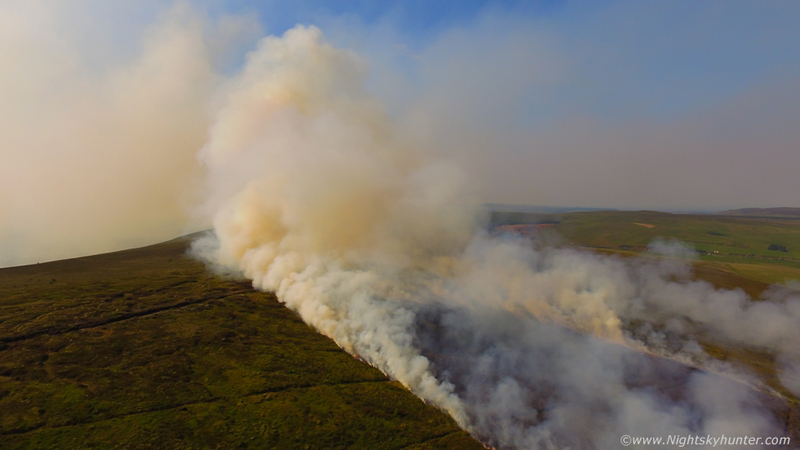 After a very successful and thrilling flight obtaining aerial stills and video we landed our drones, grabbed the DSLR and water, then hiked across the peat land and marsh land to get a good viewing point and began taking DSLR stills. Look at the base of the R fire in this image, memorize the scale then view the image below. This is the same base at 400mm, now check out the scale, you can see fire fighters in action beating the flames, now look again at the above image and prepared to be shocked at the size of the fire. Another telephoto image cropped in close, five fire fighters on view, I honesty don't know how they worked in these conditions, 30 degrees C under a blazing hot sun and beside a massive fire, for hours, full respect to these men. 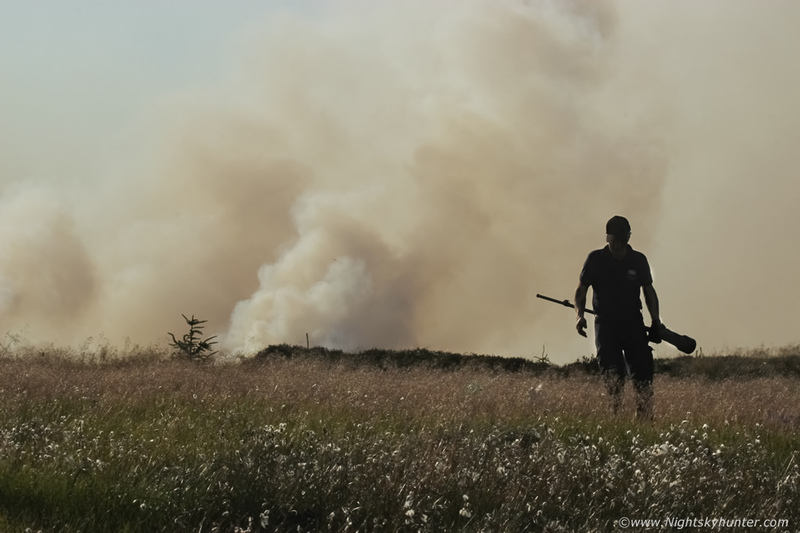 Ferocious!, it was roasting outside even by early evening, especially hiking over this peat land in such heat, we could smell the smoke in the air for miles, even doing photography was tough. We headed back to the vans, my skin felt like it was cooking in the heat, we were desperate for water. 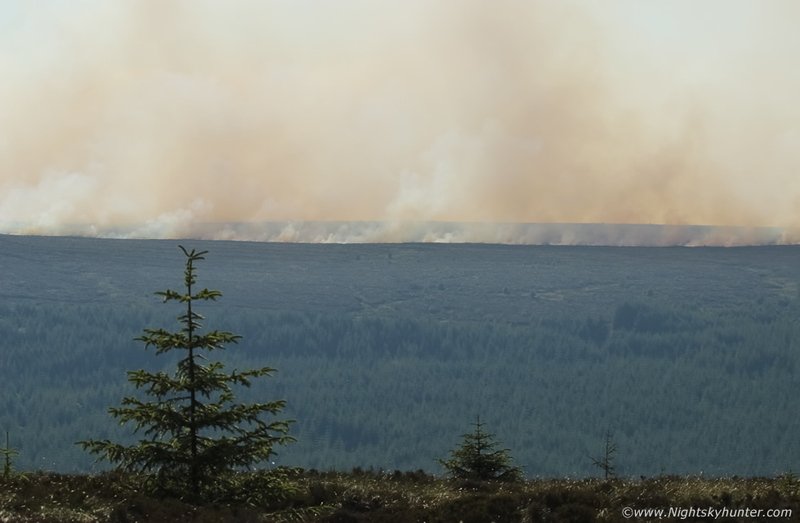 I looked back and saw Nigel approaching with DSLR and monopod in hand and took this image with the fire in the distance, I think it summed up the situation perfectly. Nigel also worked in the fire service years ago and had battled gorse fires so this scene actually captures his essence perfectly, the past and present as one. We drove to the filling station and grabbed bottles of water and energy bars then returned back to this location, hydrated, rested, it was now evening time, we had been out shooting for hours and hours, then suddenly we heard a helicopter approach. 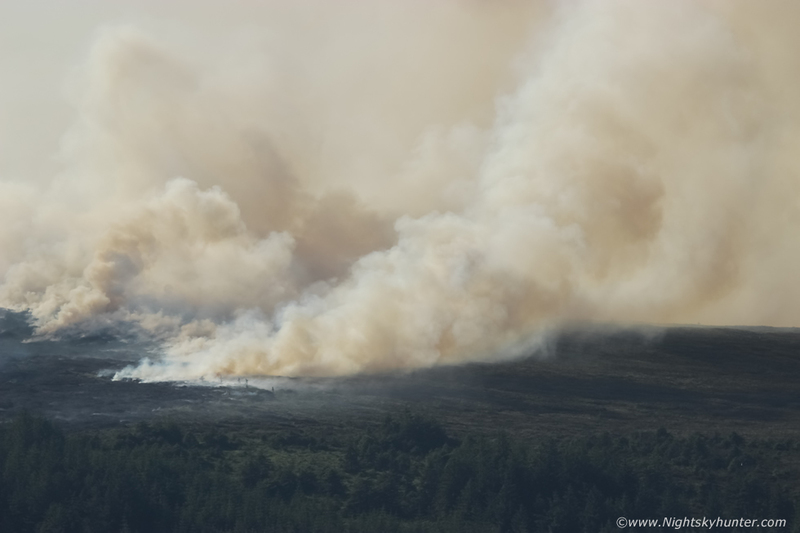 It was the Irish Coastguard helicopter from its base in Co. Sligo, it passed low overhead and made its way to the fire. 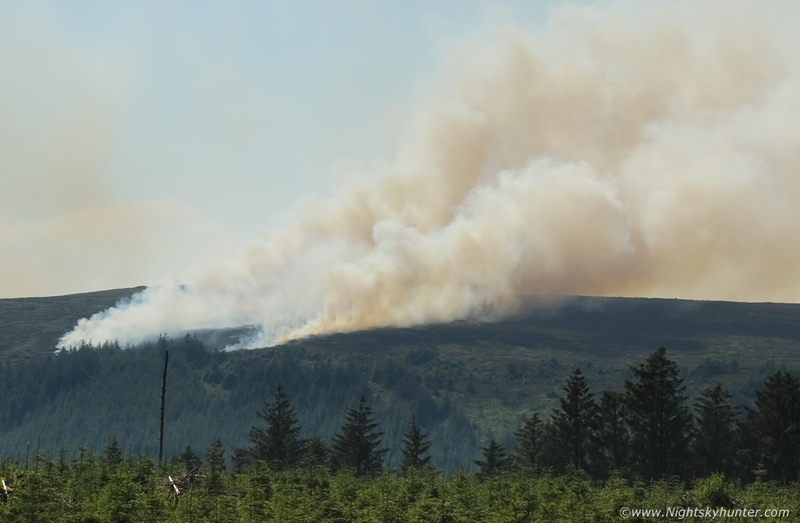 It then dropped fire fighters off on the mountain and went back to lower ground, landed in a field beside the filling station then five minutes later it was back in the air again, non stop back and forth, it was turning into non stop action here. 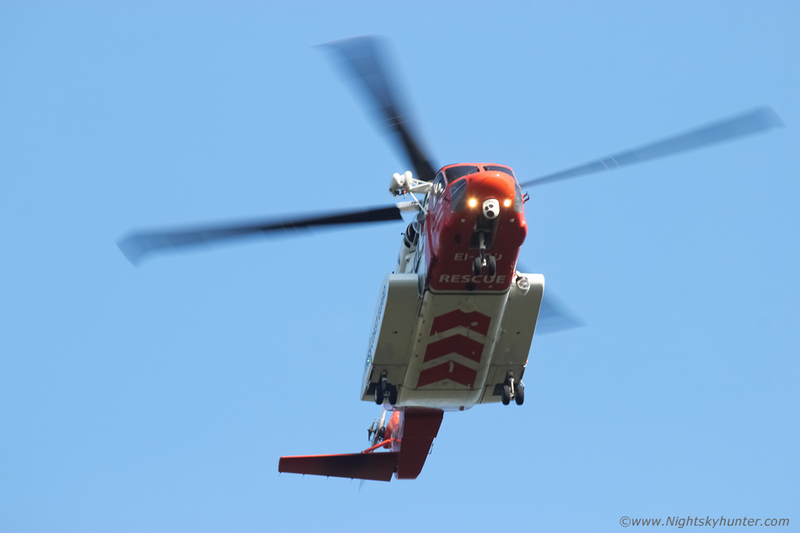 All drone operations were ceased, we grabbed the DSLRs and were back in action, here's the chopper passing overhead. 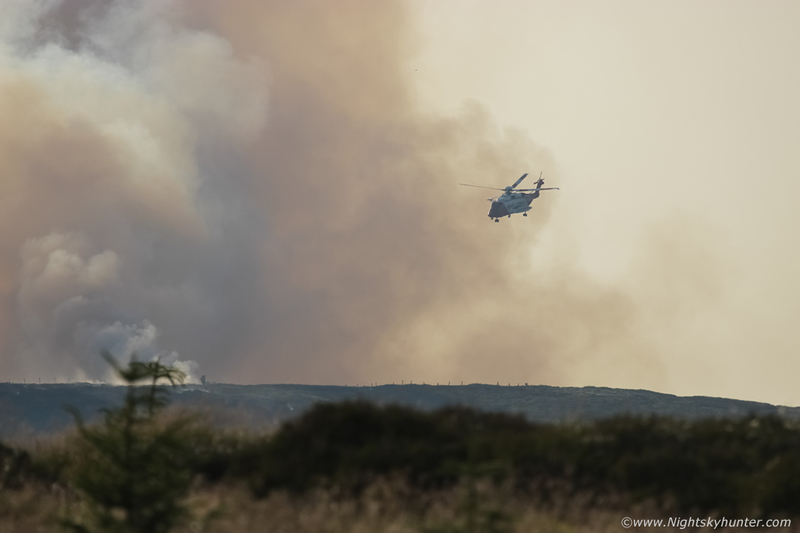 We had a perfect view of the operation unfolding, never before have I seen a helicopter here associated with a gorse fire, the fact that it was dropping fire fighters on the mountain and coming back for more continuously was amazing, here she is coming in to land on the hill adjacent to the fire. 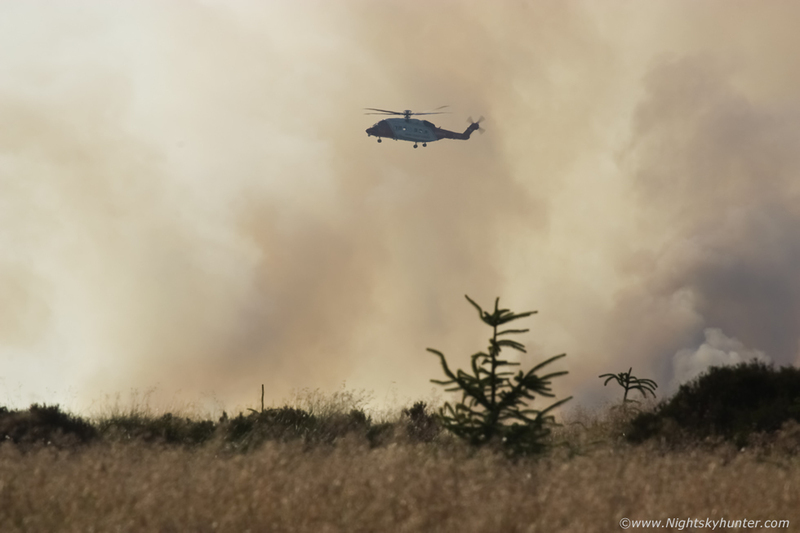 Crew dropped off, helicopter climbing against a back drop of smoke filled sky, Nigel and I were shooting away with our telephoto lenses, getting the chopper with the fire in the same field was the trophy image. Chopper banking ready to make another close range pass over us, our shutters clicking, sun cooking us, heat still intense here even during this late hour, we had many opportunities to shoot this scene as the chopper returned every five minutes. 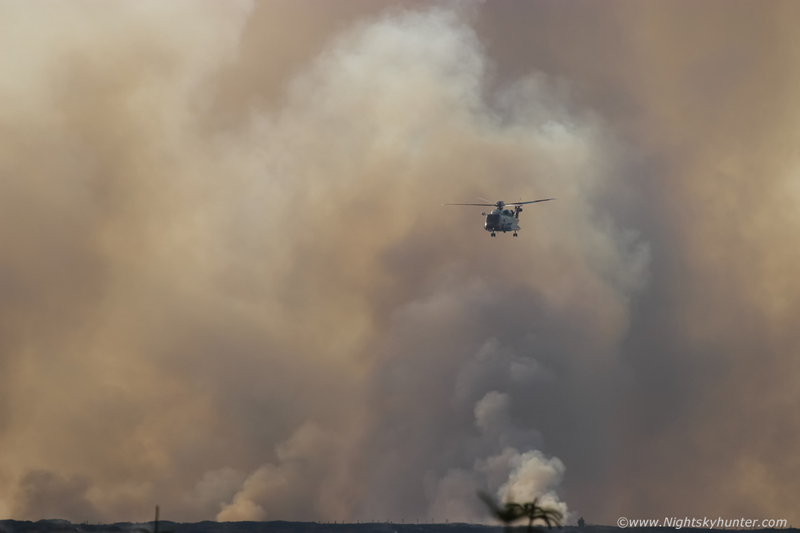 Quite an epic scene close so to home, I actually said to Nigel this looked like a scene from a Vietnam movie, chopper against a backdrop of fire and billowing smoke plumes, rotors vibrating, the smoke could well have been napalm, this truly was like a war zone. I wish I had captured video of this moment but I couldn't do two things at once, however I'm glad I got these stills for the memories. 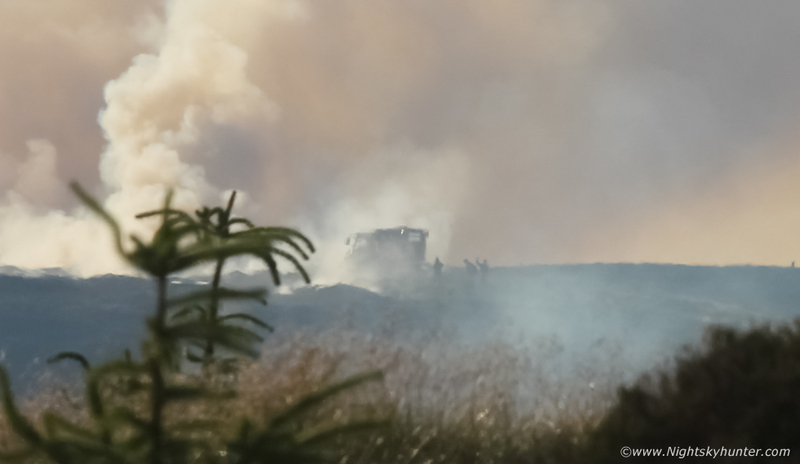 We spotted something on the mountain close to the fire, seemingly engulfed in smoke, what the heck was that?, 400mm capture cropped in close, fire fighters and what looked to be a 4x4, or perhaps an all terrain vehicle or ATV. We got more supplies, bottles of water, sandwiches, chocolate, then back on the scene again, it was 22.00 BST and a stunning sunset scene was unfolding so we decided to stay here and observe. 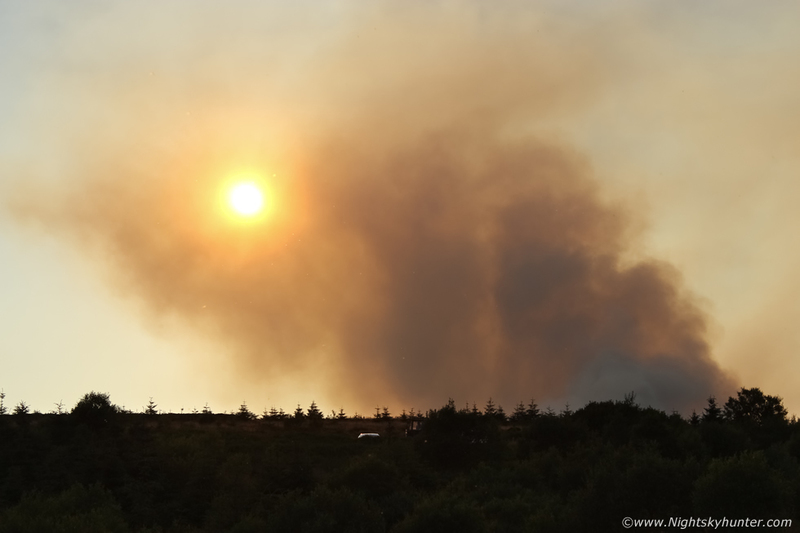 The sun was slowly setting behind the smoke plumes, as it lowered further the smoke filtered out the sun's intense light, the disk turned vivid yellow then orange with the naked eye back lighting the smoke. I set up my DSLR, tripod, 18-55mm and 24-70mm lenses and began recording video with the intention of making a time lapse. 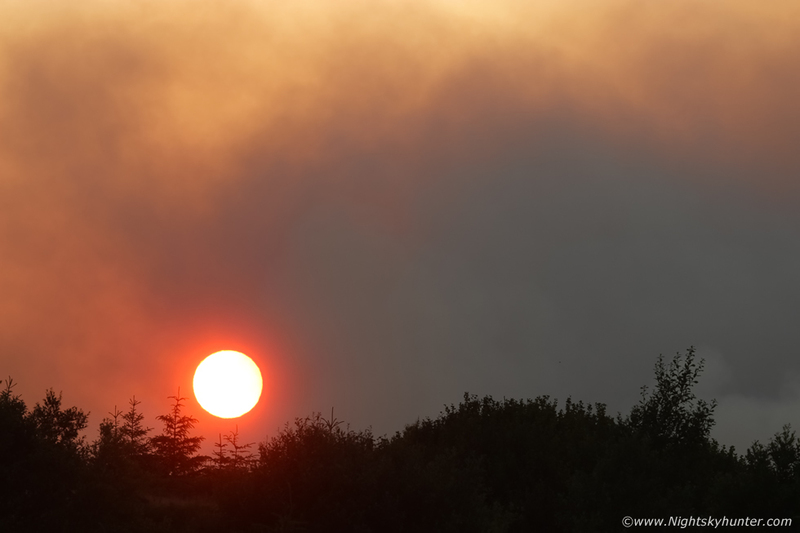 The disk turned blood red as it descended lower behind the smoke, visually the scene was spectacular, I never thought I would be shooting a rare gorse fire sunset when I woke up this morning. Please continue to page two for the follow up two days.